Sydney Aquarium and Sydney Wildlife World in the Darling Harbour are Sydney's number 1 attraction. Visitors and tourists can see huge sharks, turtles, penguins, dugongs and other amazing marine life. Sydney Wildlife World is one of the worlds largest animal encounters under one roof. Explore three levels, over 65 exhibits representing nine different habitats, and more than 250 different species of Australian animals like one of the world's largest Saltwater crocodiles 'Rex', koalas, red kangaroos, yellow-footed rock wallabies and much more. This image belongs to the travel and nature stock photo library. This stock photo of Darling Harbour at Twilight is available for licensing for commercial and editorial uses including websites, blogs, books, magazines, brochures and advertising. Restrictions may apply for images which contain third party copyrighted material or sensitive subjects. Photos of artwork are for editorial use only. 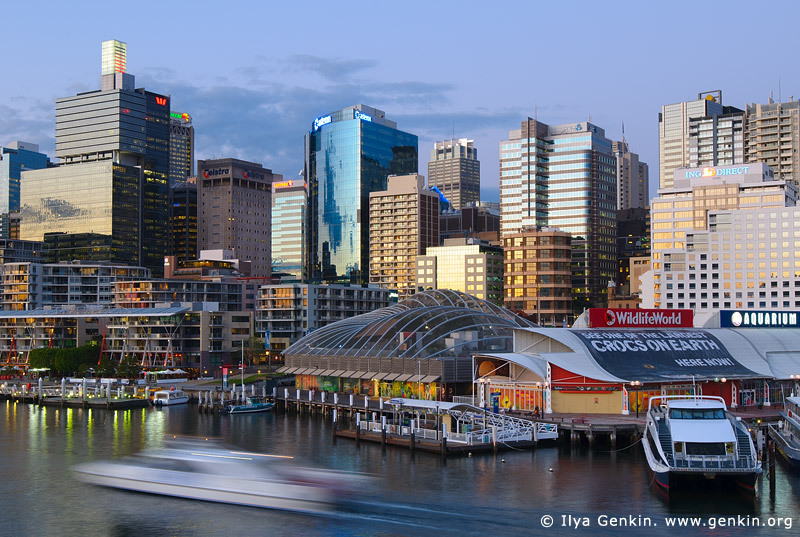 This image id AU-SYDNEY-DARLING-HARBOUR-0015 of Darling Harbour at Twilight, is copyrighted © by Ilya Genkin. This is not a public domain image.